ANITA was the code name given to the research project started in 1956 by the Bell Punch Company to investigate the possibility of producing a commercial electronic desktop calculator. Development of the calculator at Bell Punch in Uxbridge was under the leadership of Norbert Kitz (also known as Norman), who had worked on the pilot model of the "ACE" (Automatic Computing Engine) at the National Physical Laboratory, at Teddington, Middlesex, in the late 1940s. An interview with Norbert Kitz in "Anita's Wereld" (Anita's World), an Anita advertising flyer produced by the Dutch distributor in 1963 gives the following background leading to the start of the research project. Kitz had graduated in 1950 from the University of London after writing a dissertation on digital computing. For the introduction to the dissertation he visited the Science Museum in London to study the mechanical calculators on display there. It occurred to him then that the next important step in the development of the calculator had not yet been taken. This was the production of electronic calculators for use in the office. He could see from his knowledge of computer electronics that there was a path leading to the electronic calculator. Unfortunately, the major mechanical calculator manufacturers of the time were far away in Germany and America, and so Kitz's idea progressed no further. However, it was during the early 1950s that Bell Punch's adding machine business was expanding very rapidly, helped by post-war restrictions on imports of foreign models into Britain. In 1956 Kitz fortuitously had a chance meeting with some of the directors of Control Systems, the Bell Punch parent company. During a conversation about electronic computers he mentioned his idea of an electronic calculator. Bell Punch had just set up an electronics department and the Control Systems management enthusiastically took up Kitz's idea and put him in charge of the development project. Kitz said that he had the enormous luck of some brilliant electronics engineers in his new team, and a management with great vision who helped him to overcome the problems encountered. To develop the electronic circuits for the four arithmetic functions: add, subtract, multiply, divide. To develop an electronic circuit which could store numbers being used in the calculation without taking up a lot of room and requiring a lot of power. To produce a suitable keyboard to enter the numbers of a calculation. This had to have a long life and also give good electrical reliability. To develop a suitable numerical output to display the results. However, a major constraint was to be the cost of the calculator. The cheapest electronic computer then cost approximately £50,000 [about US$140,000], but to be competitive with mechanical calculators the target selling price of the electronic calculator was in the range £350 to £400 [US$980 to US$1120]. The research project was given a code name to help maintain confidentiality, and the name chosen was ANITA. This name was to stay with the calculator into production when it was required to explain what it meant — "A New Inspiration to Accounting" (or sometimes to Arithmetic) was dreamt up. 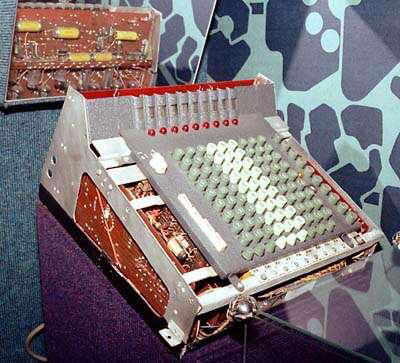 The machine with its covers removed in the photograph above is the prototype machine of 1958 which proved the concept of an electronic desktop calculator. This is usually on display in the Science Museum, London (if specifically wanting to view this exhibit, it is advisable to contact the museum beforehand to check that it is still on display). As can be seen from the photograph, the early ANITA models are full-keyboard machines with a column of keys, 1 to 9, for each decade, similar to the Sumlock mechanical calculators. In some ways this was the easy part. There then followed several years of great effort in finding electronic and mechanical components suitable for production, testing them for suitability, and where necessary producing them themselves or finding someone to produce them to their specification. The early computers of the 1940s and 1950s used the mature vacuum tube technology of the day. In the 1950s and early 1960s transistors were new and undergoing rapid development. They were also expensive and prone to catastrophic failure if badly treated electrically. So it is no surprise that the first commercially successful electronic desktop calculator used vacuum tube technology. During the development of the ANITA electronic desktop calculator several different approaches were tried before the final version was arrived at, using 170 cold cathode tubes, a "Dekatron" counter tube, and "Numicator" indicator tubes (for further information on these devices see the page "The Technology Explained" on this site). "After a period working on Ground Position Indicators, navigational instruments designed and produced by the Company for the R.A.F., I became involved with the SAM (Semi Automatic Multiplier) calculator. This had complex mechanisms giving an advanced multiplication feature and was probably the last notable milestone in advanced mechanical calculator design produced by Mr. C.F. Webb, the Company's Chief Designer, before his retirement. It was launched around 1958 and I recollect being given the task of producing an illustrated handbook for the production and service departments which had detailed assembly and adjustment guidance. It comprised a series of photographs in order of the machine's assembly, each with a transparent overlay pin-pointing the important features together with a detailed description outlining the checking and inspection of each stage of assembly in the correct sequence. I joined the ANITA design and development team in the early stages when a lot of work was necessary to satisfactorily interface the electronics with the necessary mechanical features. This revolutionary calculator, "A New Inspiration To Arithmetic", was, by necessity, a transitional stage between the accepted electro-mechanical machines of that period, and electronic calculators as we know them today. It was not smaller than the machines it was replacing, and it still had a 'full' keyboard. That is, lines of key buttons numbered from 0 to 9. And it still included a number of precision mechanisms. However, instead of calculations being effected by a system of key bars, gears, cams and 'number' wheels printed with the figures 0 to 9, they were achieved electronically with the answers displayed on numicator (Nixie) tubes, fast and comparatively silent. Funnily enough, experienced calculator operators were slow to appreciate the technological breakthrough because they could not get used to the lack of 'feel' and noise that was inherent in mechanical machines. The same phenomenon was experienced by typists changing from manual to electric typewriters. The task of translating the output of the ANITA electronic design team's proven circuit diagrams into a tangible product had to be undertaken by the Company's drawing offices. The overall responsibility for this was given to the then Chief Draughtsman, Gerry Mude, and subsequently, myself. Electronics were in their infancy. Microprocessors were a long way off and transistors were not yet available at a price that would be economically viable considering the numbers that would be required for ANITA. The initial development included a Dekatron counter tube, thermionic valves, cold cathode 'trigger' tubes and large numbers of discrete components linked via various switching methods to precision mechanisms. The novel use of the cold cathode tubes was at the heart of the first ANITA's and the concept was displayed in the Science Museum in London almost as soon as the first machines appeared on the market. The development of the machine was extremely interesting and the Company did a great deal of pioneering work, much of which was patented, and, in keeping with its past philosophy, everything possible was manufactured 'in-house'. For electrical safety reasons the casework of the machine was designed as four interrelating plastic mouldings and a steel keyplate coated with a special insulative paint. Large injection mouldings were in their infancy and although the Company had its own plastic moulding facility, it did not have the expertise and equipment to produce these for ANITA at that stage, so they were sub-contracted to General Electric in Birmingham." A moulded plastics casing shown here [above] is described by the makers, GEC (Engineering) Limited, Erith, as being particularly complex. This component forms the casing of the new Anita electronic desk calculator being marketed in the United Kingdom by Sumlock-Comptometer Limited. The casing is of fabricated construction comprising 13 moulded items varying in weight from 0.13 to 50 oz. It is made of Cycolac T, an ABS plastic. This is said to have been chosen because of its strength and good surface finish. The Moulded Plastics Division of GEC comment that because of the intricate nature of the design, several new techniques were evolved. One of the problems was the variation in thickness particularly at the points where bosses and fixing brackets were required. This was largely overcome, they add, by casting these bosses and brackets as separate items and then dovetailing and cementing them into position on the main component afterwards." For improved fire-retardation properties the ABS (Acrylonitrile-butadiene-styrene) mouldings were later replaced by Polycarbonate. "The lines of keys were of similar basic design to those in the Company's previous mechanical calculators, except that instead of being entirely precision mechanisms, they now had to operate electrical switches. This was achieved by attaching to each line of keys a printed circuit with associated rotary switches. Following the Company's willingness to pioneer new methods, the pivot pins for the switches were moulded directly into the printed circuits using a nylon moulding material. The switches themselves were small printed circuits which were assembled onto the pivot pins making a three-point contact with silver graphite contacts riveted to the keyline printed circuit. The switches were held against their mating circuit by conical springs retained by circlips. As usual, we designed and manufactured all the parts ourselves but initially these switches were troublesome and became part of our 'learning curve'. If a key was struck hard, the sudden transference of movement from the key to the rotary switch sometimes caused the switch to bounce and momentarily part company with one or more of its contacts on its printed circuit board. This was enough to create wrong answers and was a problem we were saddled with for some time during the development of the ANITA. We eventually solved it by mounting the printed circuit on rubber grommets rather than fixing it rigidly to the metal keyline, and providing a flexible moulded nylon arm to the rotary switches which dampened the effect of harsh key operation. Another aspect of ANITA which was new to the Company's experience was the use of printed circuits, then in their infancy. Bruce Routledge, a tool design and methods engineer, was given the task of setting up the initial printed circuit production facility from scratch, which was quite a challenge. It involved precision photography, silk-screening, etching, plating with precious metals as well as the normal machining processes of blanking, piercing and drilling. From the design office's point of view, it meant taking the electronic engineer's circuit diagrams, suitably partitioned, and designing the printed circuits to take into account required size, optimum position of the electronic components to be soldered to the board, method of fixing within the machine, and width and spacing of conductors. As we progressed and became more knowledgeable, many other factors had to be taken into account, but in the beginning our methods of designing the printed circuits were necessarily basic. The circuits were drawn twice full size which had two main benefits. It was easier to maintain accuracy, and when the drawings, or artworks as they were called, were reduced photographically to their required size, any slight inaccuracies were reduced by 50% automatically. Looking at today's printed circuit design methods using suitably programmed computers, our methods in those days seem positively archaic. We first drew outlines of the required copper track and component solder pads in pencil, and after careful checking the outlines were overdrawn in ink. Then, using a fine paint-brush, the outlines were filled in with matt black ink — quite a laborious process. The master artworks, which were the outcome of all this work, were ultimately photographed and reduced in the process to their required size. The photographic positives/negatives were then used to produce silk-screens, which in turn were used to transfer the images of the printed circuits to copper-faced laminated board using a solder resisting ink before etching away the unwanted copper. 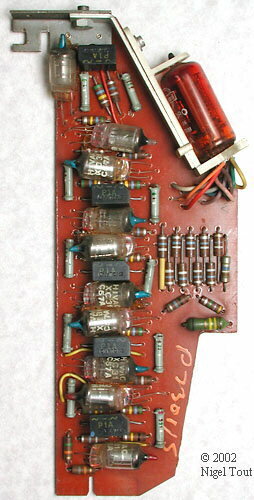 One of the 12 counter/display circuit boards in an ANITA Mk 8 calculator, each with the Nixie-type display tube mounted on the edge. The board holds ten XC-31 cold-cathode switching tubes and 5 black selenium rectifier diode blocks in a ring-counter circuit. As we gained experience, so our methods of designing and producing printed circuits became more sophisticated. Self-adhesive tape appeared on the market which dramatically reduced the time taken at the design stages by eliminating the pencil and ink drawing methods. And we evolved systems of control which ensured that all 'master' drawings applicable to any one printed circuit were interrelated so that expensive mistakes could not be made during production. Until the appearance of ANITA the Company's products had been designed to be tough and durable. Electronic products were new to the Company, and although the first ANITA was a milestone in calculator design as far as its functions were concerned, a number of shortcomings began to manifest themselves as a result of the way they were handled in transit. The very heavy constant voltage transformer in the machine broke loose in a number of instances, and the Dekatron and other valve-like components sometimes jumped out of their sockets during transit. Even worse, the numicator (Nixie) tubes tended to collapse causing their 10 or 12 lead-out wires to short circuit with each other. All these things were a part of our learning curve and had to be dealt with quickly. Fortunately, the Company was a subscribing member of the Paper and Packaging Research Association in Leatherhead through its considerable paper manufacturing and ticket printing business and we were able to commence an ongoing programme of transit testing at their laboratories. Whilst each new ANITA model was at the design prototype stage we would take a couple over to Leatherhead for testing. Packaging is not a precise art and the optimum solution depends on an estimate of the product's 'fragility' and the type of handling it is likely to encounter during transit. It is not for the faint hearted to watch a pack containing months of design work being dropped on all six sides and eight corners in various situations and from various heights to simulate the hazards of road, rail and air transportation. It was also necessary to ensure we complied with the mandatory international standards in respect of electrical safety and other standards such as those concerning radio and television interference. As a first step I was required to submit an ANITA to the British Standards Institution [B.S.I.] for testing. Being the first of its kind, the ANITA aroused a lot of interest at the B.S.I., and whereas their testing of previous office equipment followed well proven parameters, I think they reappraised those parameters when confronted with a machine which was so revolutionary at that time. After stringent testing by B.S.I, and some minor redesign work on our part, the ANITA was granted the B.S.I. Certificate of Electrical Safety, and so continued a long association as we developed one machine after another. At that time, there were no reciprocal agreements between the various International Standards Authorities, and most Countries had differing requirements in respect of electrical safety. The U.S.A. had many differences in their standards and my next task was to get ANITA approved by the Underwriters Laboratories of America. From its name, this organisation, although the equivalent of B.S.I., was obviously linked to, and supported by, the American insurance industry, and once we had shipped an ANITA out to them, I had a lengthy period of correspondence with questions and answers flowing back and forth. Underwriters Laboratories gave us a difficult time and the worst thing was that they insisted on the ANITA casework being moulded in an acceptable flame-retardant material. At that time the cases were injection-moulded in an ABS (acrylonitrile-butadiene-styrene) material which was not flame retardant but which had been accepted by B.S.I, as not hazardous in our application. The moulding material we had to turn to was a polycarbonate called Makrolon which met the requirements but was new at the time and a difficult material to mould, particularly if the mouldings were large. The General Electric Company, who were producing the ABS mouldings for us, had a great deal of difficulty in using polycarbonate, but eventually overcame the problems and we were able to gain U.L. approval for ANITA. But that was only the beginning. Germany, Switzerland and the Scandinavian countries all had mandatory standards with which we had to comply. Switzerland had a particularly annoying one concerning mains [AC power] cables. Whilst the European countries tended to have different colours for the insulation of the mains, neutral and earth wires to that of Britain, Switzerland went one further and insisted on a special identifying thread inside the moulded cable. At that time, this special cable was only obtainable in Switzerland, and as our mains leads at that time had a special socket moulded on one end, it was expensive and a nuisance, to manufacture a relatively small quantity just to meet our export requirement for Switzerland." Copyright © 2001, John Sparkes. 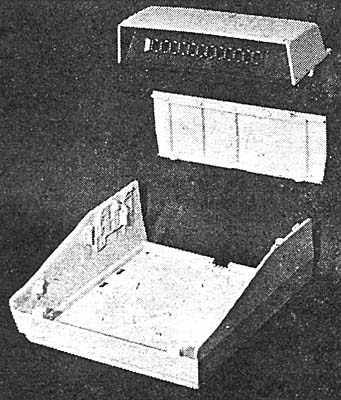 "Intricate Moulding in ABS Plastic", Engineering, 30 March 1962, p435.